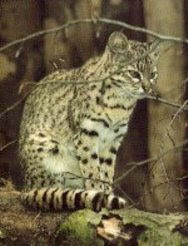 Pampas cats, Colocolo (Leopardus colocolo), have an expansive geographic range. In fact, they have been said to have a greater geographic range than any other South American cat. They are found in the forested slopes of the Andes in Ecuador, Peru, and Bolivia, the cloud forests of Chile, the Paraguayan chaco, open woodland areas of central, western, northeastern, and southern Brazil, the pampas of Argentina and Uruguay, and southern Patagonia. Just as the geographic range of the species varies widely, so does the habitat in which it is found. 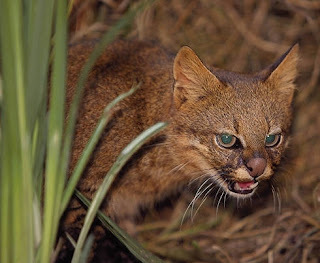 It can be found in open woodland or scrub thicket, cloud forest, cold, semi-arid desert regions, low-lying swamps, floodplains, and mountainous slopes. The only forest regions it has not been found to inhabit throughout its range are lowland tropical and temperate rain forests. The physical characteristics of L. colocolo vary across its range in South America. In the high Andes it is gray in color and has reddish stripes that are broken up into spots. In Argentina, the coat of L. colocolo is generally longer and yellow-brown in color with a muted pattern. Long fur is also typical to those individuals living in Brazil, but they tend to be rust colored with black bands on their yellow to orange sides and their lateral underparts. 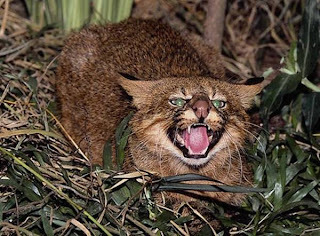 A three month old male pampas cat from central Brazil that was brought into a zoo had the typical rusty color but also had very dark, irregular stripes over its entire body. By the time it had reached eight months of age, the dorsal and lateral striping had disappeared, and only the stripes on the limbs and underparts remained. 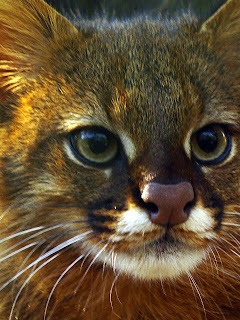 Ears of L. colocolo are large and more pointed than most other small, neotropical cats. Typical head and body length is 435-700 mm, tail length is 220-322 mm, and shoulder height is 300-350 mm. Average weight is 3 to 7 kg. The mating system and behavior of this animal are not known. L. colocolo in captivity in the northern hemisphere breeds period from April to July. Gestation is from 80 to 85 days, and 1 to 3 young are born per litter. Breeding season in the wild is unknown. Longevity in this species has not been reported. However, other felid species of similar size typically live between 10 and 15 years. L. colocolo is predominantly nocturnal and terrestrial. In the wild individuals have been observed during the day. Also, it should be noted that a male at Brazil’s Parque Zoológico de Goiânia was a skilled tree climber, spending most of his resting periods draped over the highest fork of the tree in his enclosure. Very little is known about the social structure and communication methods of this species. Individuals in captivity have been observed erecting the crest of long hair along their midline from head to tail when excited. L. colocolo preys upon small mammals, such as guinea pigs, as well as ground-dwelling birds. It has been observed taking penguin eggs and chicks from nests. 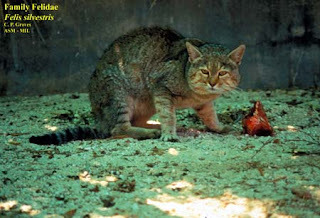 Pampas cats are known to take poultry in areas of human population.